My older child has the tendency to want things just so. Just as they have always been. Not being one to embrace change in any way, we've had some issues with her wardrobe - the size 5 sweatshirt she's been trying to wear up until last fall comes to mind... the socks that are worn through at the heels because she has turned her nose up at every proffered replacement. At any rate, she's well into elementary school, and all the stores are full of jeans. We've never pushed jeans, because on little kids, they're kind of silly. So, she's been wearing knit pants, mainly from Gymboree, which are bright, in fantastic patterns, and I guess they stopped selling them a few years ago. Right now, it seems the stores are full of jeans and leggings, and you can't find pants to save your life. But you can't tell that to my kid, because she wears pants. So, well, faced between my kid's stubborn streak and the desert of the mall, where else does one go but the fabric store? I got these Riley Blake knits from Pink Castle Fabrics. They were fairly close in value, so I over-dyed the orange one with a gold dye to make them look less exactly the same. The dye process also warped (shrunk?) 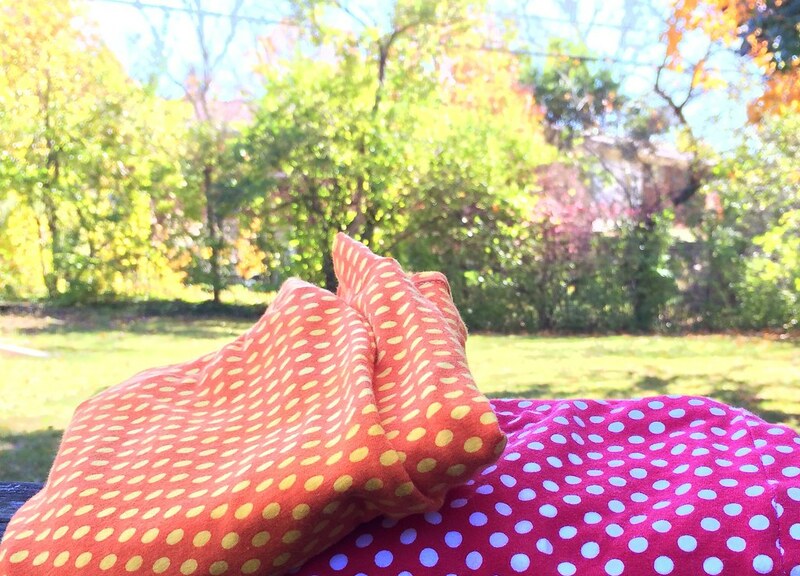 the orange fabric so the round dots became flattened ovals, which was all to the good. I used McCall's M6985 the only knit pants for girls pattern I could find. I started with the size 8, since they don't list, well, hardly any useful measurements for pants (no rise, no inseam). I used an art gallery knit for my first pair (at $18 a yard! - not the best idea for a muslin) and even after shortening the rise and narrowing the waistband it was way too large, so I put that away for next year. Then I made a size 7, with an inch and a half removed from the rise, and the waistband width cut practically in half. And that fits her perfectly. 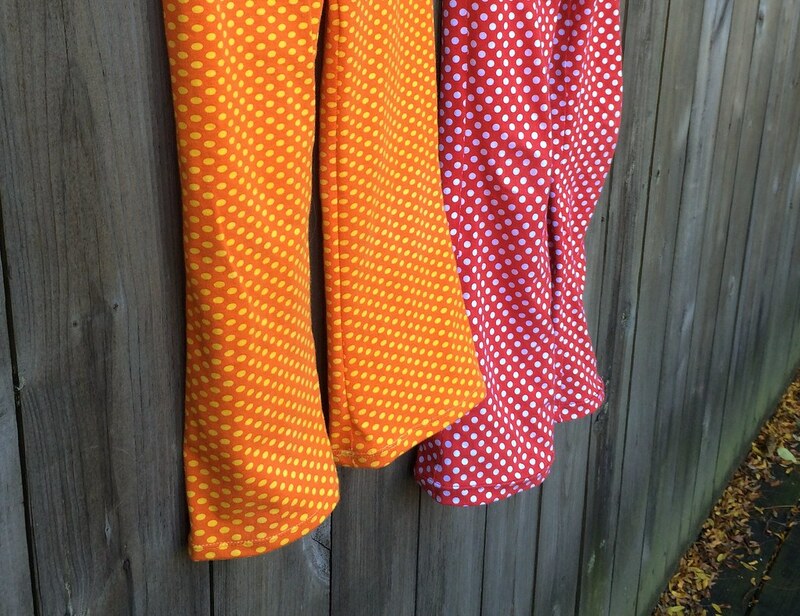 On the second pair, the orange one, I shortened the waistband by another half inch. 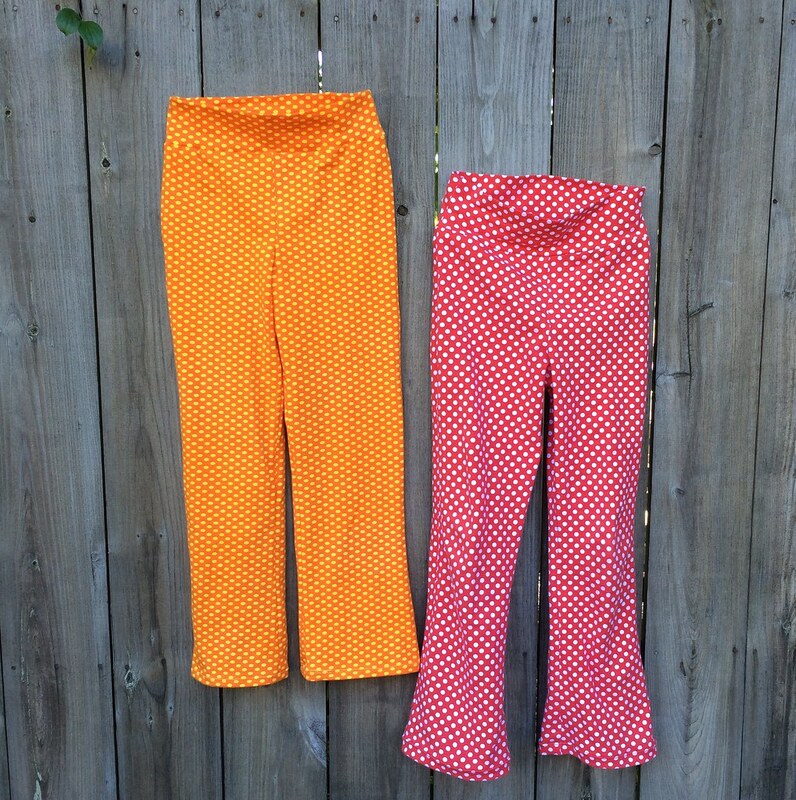 These, along with a few pairs gleamed from vigilant patrols of children's consignment stores has resulted in enough pants to get us through the winter, but now that I've started looking for knits, I am hard pressed not to buy... I mean, she'll probably need more pants next year? And it would be a shame not to get these owls or these animals, right?